This year’s annual Patronal Feast Day – Slava Celebration on Sunday, January 28th, 2018 at St Sava Serbian Orthodox Church in Phoenix, Arizona, was very special in many ways, but most of all on the account of the visit of their Graces Bishop Maksim and Bishop Kirilo. Bishop Kirilo was elected as hierarch almost four years ago as a Vicar Bishop to His Eminence Amfilohije of Montenegro, with a special appointment to take care of our Church in South America, for the first time visited Phoenix as a part of his larger North American tour. Fr. Dragomir, St Sava Parish Priest, Fr. Stanislav St. Nicholas Parish Priest, and Fr. Jovan Katanic Diocesan Deacon together with numerous children and faithful welcomed their Graces at the gate of the St. Sava Church property with a festive procession proceeding to the Church for the spiritually uplifting Holy Hierarchical Liturgy. St Sava’s “Stevan Hristic” Church Choir was especially inspiring by their beautiful liturgical responses. At the end of Divine Liturgy, following the traditional Slava Procession around the Church, the Slava Kolac was blessed at the entrance doors of the Church surrounded by hundreds of people. Honored 2018 Slava Kumovi were Dr. Petar and Mrs. Milica Novakovic along with their children Nina, Natasa and Aleksandar. Following the Blessing of the Kolac, His Grace Bishop Maksim had a very special presentation. He honored Parish Priest Fr. Dragomir by elevating him to the Rank of Protopresbyter-stavrophor. Fr. Dragomir humbly thanked His Grace and asked all the faithful to proceed to the hall for the festive banquet prepared for all guests. St. Sava Children prepared a wonderful program under the direction of Church School Teacher and St. Sava Program Director, Katarina Stanisic. Besides reciting traditional poems, the children sang exceptionally beautifully accompanied by pianist Miss Isidora Jovanovic, Arizona State University doctoral candidate. All four ensembles of KUD Gavrilo Prinicip performed for the program finale. The next morning, on Monday January 29th, His Grace Bishop Kirilo first visited St. Anthony’s Greek Orthodox Monastery near Phoenix accompanied with Fr. Dragomir. He briefly met with Elder and Monastery Founder Fr. Ephrem, and afterwards he was received by Abott Paisus when many gifts were exchanged. 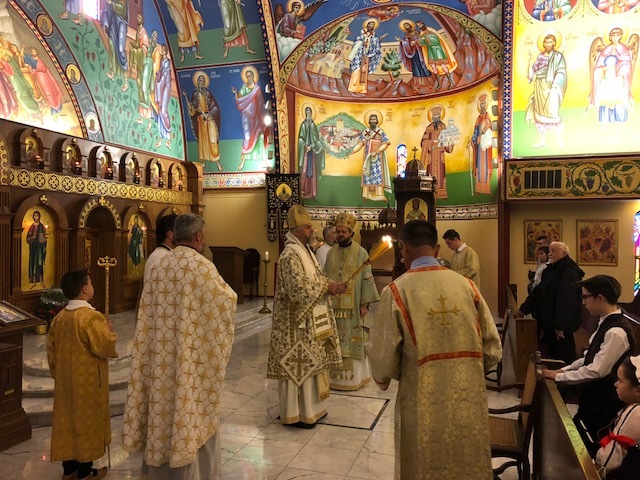 In the evening of that same day, many faithful from St Nicholas Serbian Orthodox Church in Phoenix had a chance to welcome their Graces Bishop Maksim and Kirilo at their Church. An elegant dinner was prepared at the St. Nicholas hall in their honor, followed by a special evening talk with the Hierarchs. His Grace Bishop Kirilo beautifully talked about many aspects of our faith and also about the life and struggles of the Serbian Church in South America.